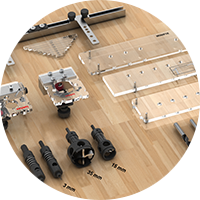 SABLON JIGS & HARDWARE FOR ALL YOUR WOODWORKING PROJECTS! Build your own cabinets and other wood furniture to fit your space & taste. Make your woodworking project with precision and perfection easily. Proudly enjoy accomplishing your own design within your budget and free time. 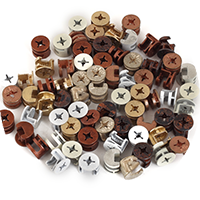 Choose from an array of colored cam connector (minifix) hardware to match your wood & panel. Minifix is the most important and improved connector in the furniture industry today. It can be used as a removable or permanent connector with or without dowels. 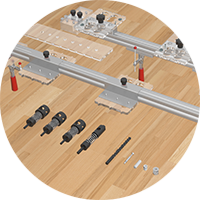 It allows easy assembling of furniture and reduces assembly time. Ideal for small and mid-size shops. Reduce your production time, costs and space by manufacturing your own cabinets as parts, store them as parts, stain and finish them as parts, ship them as parts; then reassemble them at jobsite. Your production now is as fast and easy as it can get. All these different jigs work in concert due to their systematic design, any woodworker or small shop can build their furniture & cabinets in a very simple and quick way.